Quite similar in appearance to parsley, cilantro or coriander (Coriandrum sativum) is a popular spice used in the Mediterranean and Asian cuisines. While coriander seeds are roasted and eaten as a snack on their own, the fresh leaves season a variety of traditional dishes in Indian, Thai, Chinese, Italian, Greek, British and Mexican cuisine. Most important, both the fresh and dried spice has an impressive nutritional profile and boasts several wonderful health benefits. If you have a preference for coriander as a spice and use it constantly in the kitchen, then you are truly fortunate because this parsley doppelgaenger is a rich source of vitamins A, C, K and folate, nutrients with quite incredible health benefits, as you will see in the article below. 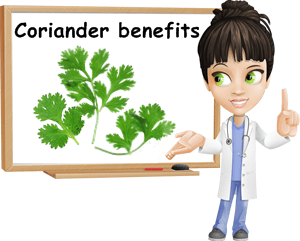 Coriander is particularly beneficial for eyesight, immunity, cardiovascular and bone health as well as possesses anti-hemorrhagic properties, skin benefits and benefits for pregnant women. What does coriander (cilantro) look like? Coriander is a popular culinary spice that also goes by the name of cilantro. Other less common names include dhania and Chinese parsley, a tribute to its resemblance to yet another healthy herb which is parsley. Coriander is a deep green plant with small, lobbed leaves and thin, octopus-like stems. It can grow up to half a meter and bear small white flowers and edible tiny brown seeds. Coriander leaves, seeds and roots are all edible, but as with all herbs and spices, best eaten in amounts typically used to season food. This is because coriander, and all herbs and spices really, are rich in essential oils which are healthy in small amounts, but not so much if intake is high. What does coriander taste like? Believe it or not, there are people who are genetically predisposed to feel repulsed by coriander. Apparently, they posses a gene which makes them find some compounds in coriander as repellent. However, this is not the case with everyone. Many people find fresh coriander leaves pleasantly aromatic, even lemony, with a slight citrus flavor as well as earthy undertones. They are of a perfectly balanced bitterness. Frozen or dried coriander leaves tend to lose most of their flavor. Coriander seeds are somewhat sweet and nuttier in taste, especially when roasted. If you are pregnant, you can add some fresh coriander seeds to your diet and thus increase your folic acid, or vitamin B9 intake. Dietary folic acid helps prevent neural tube defects of the brain, spine and spinal cord in newborns. However, if you have never eaten cilantro before, it might be best to consult a doctor first and find out whether or not you are allergic to it or likely to experience any side effects. 1) Helps improve eyesight. Rich in vitamin A (225%), coriander leaves are ideal for a maintaining good eyesight. Vitamin A supports retina health, making it possible for us to see well even in low light during the night. The antioxidant effects of the vitamin also help lower the risk of macular degeneration (loss of central vision due to old age). 2) Boosts immunity. Coriander leaves are an excellent source of vitamin A and a good source of vitamin C, two great immunity-boosting vitamins. Vitamin A protects the integrity of mucous membranes at the level of the eyes, nose, mouth, throat, lungs and digestive tract, the parts of our body directly exposed to the outside world, ensuring they resist to viruses and bacteria attempts at infection. Vitamin C increases white blood cell aggressiveness which means our body responds better and faster to basically any viral and bacterial threat. Adding half a handful of coriander leaves to your salad will not only give it extra flavor, but will also make it extra healthy. 3) Protects against oxidative stress and chronic disease. Vitamins A, C, K and potent antioxidant polyphenolic flavones such as rhamnetin, apigenin, kaempferol and quercitin found in coriander leaves are said to protect against cell and DNA damage causing potentially cancerous mutations as well as other forms of chronic disease. Apigenin for instance has been shown to make leukemia sick cells eat themselves or, at least, detach themselves from their sick parts. Apparently, trials have not yet had success on people, but animal trials have shown great promise. In addition to this, vitamins C and K are highly efficient at reducing inflammation and counteracting free radical damage, thus reducing chronic disease risks immensely. 4) Helps strengthen bones and teeth. With 258% of the RDA of vitamin K, coriander leaves contribute to strong, healthy bones and teeth. Vitamin K not only promotes calcium absorption in bones, but also helps prevent bone demineralization, a principal cause of osteoporosis. Since you can only eat limited amounts of coriander, you can opt for other vitamin K-rich foods such as kale, chard, endive, curly endive and so on (see vegetables list). 5) Prevents arterial calcification and reduces LDL (bad) cholesterol. Rich in vitamin K, coriander helps send calcium to the right places (bones and teeth). If you were to have a high calcium intake and a vitamin K deficiency, then calcium would deposit in places such as arteries in the brain or heart or heart valves and, in time, cause what is known as arterial calcification, a sort of hardening of the artery walls as a result of calcium and other deposits. As you can see, vitamin K is essential for cardiovascular health. 6) Supports blood coagulation processes and helps prevent anemia. The high amounts of vitamin K in coriander leaves help support blood coagulation processes. However, if you are taking Warfarin or any other anticoagulant medication, you might want to talk to your doctor before increasing your vitamin K intake. Coriander leaves are also a great source of iron, contributing to the prevention and management of anemia. Nevertheless, coriander may trigger allergic reactions in some people so you might want to pay careful attention to any allergy symptoms you might exhibit when eating it for the first time. Aside from this, it remains a healthy food option thanks to its impressive nutritional profile and beneficial action of the cardiovascular and immune system, bone, teeth and eye health.